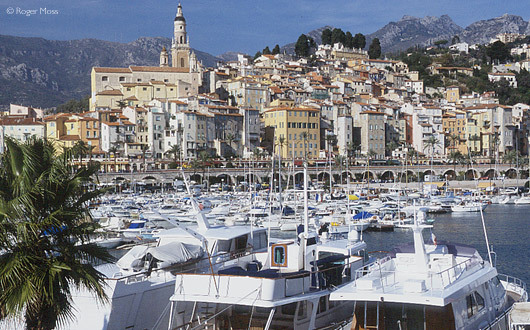 Should you be tempted to think that all the real motoring adventures are long past, think again; the Route des Grandes Alpes runs from the shores of Lac Léman all the way down to the balmy Côte d’Azur, a total distance of 684km. With so much to see, you might decide to spread the journey over several visits, savouring the experience and exploring places of interest along the way in much more depth. Either way, you’ll discover genuinely breathtaking scenery, plus a wealth of places you’d otherwise probably never get to see (or ski). Having driven every inch of the Route ourselves, we can promise you that following the legendary Route des Grandes Alpes is something you’ll never forget. …it’s a peaceful, pastoral idyll, whose rich green pastures are punctuated here and there by ancient, sun-bleached mountain chalets and autumnal stabs of fiery red and yellow foliage. 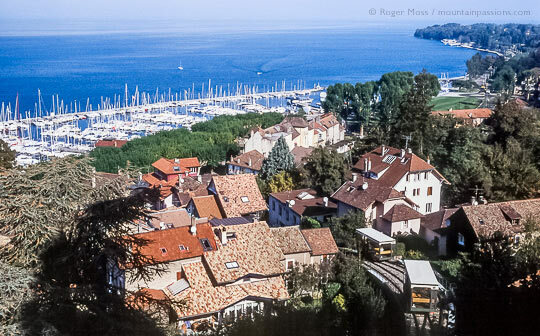 The time-honoured gateway to the Route is the spa town of Thonon-les-Bains, on the southern shores of Lac Léman (a.k.a. Lake Geneva), which retains hints of retro gentility, particularly during regular visits from the celebrated Belle-Epoque paddle steamers which still ply the clear waters of the vast lake. 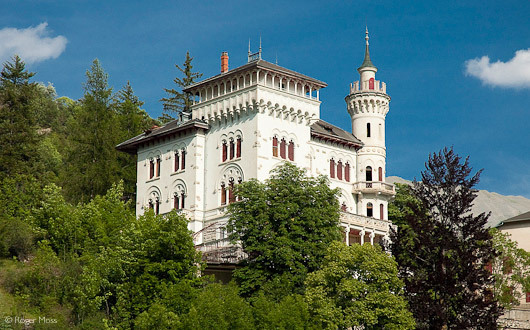 Thonon is also the capital of the French portion of the historic Chablais region, the remainder of which lies across the nearby Franco-Swiss border. From Thonon we follow the D902, whose initially tortuous course propels us within minutes into the Gorges de la Dranse, to wind our way through a series of wooded climbs punctuated by blind, craggy bends, while the river tumbles energetically below the roadside. When the curves finally begin to ease we pass a signpost for the first essential detour for travellers on the Route: the beautiful Val d’Abondance, long renowned for its AOC (Appellation d’Origine Contrôlée) cheeses and now also deservedly popular with family- and back-to-nature skiers. 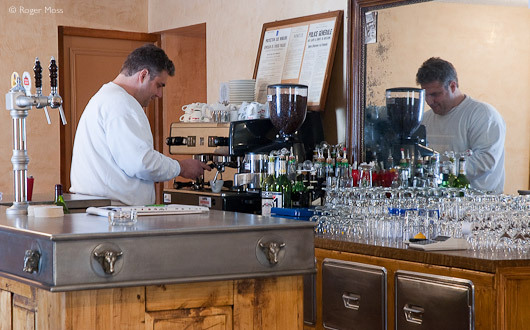 The village of Abondance is home to one of the oldest cafés in all France, the Café Pension de Savoie, which opened in 1815 and which in 2005 was beautifully restored by Franck Patelli and his wife Annette. Beside it is a famous Gothic Augustinian abbey church founded in the 12th century. The large adjoining cloisters also survive, complete with some of their 15th-Century wall paintings. From now on things begin to open up, as the road straightens for the run into Morzine. Looking like the classic, if now substantially scaled-up mountain village, the town has a distinct air of prosperity, thanks to its location at the very heart of the huge Portes du Soleil winter sports area. Overlooking it all from a dramatic setting on a high escarpment is Avoriaz, to which Morzine is linked directly by cable-car. 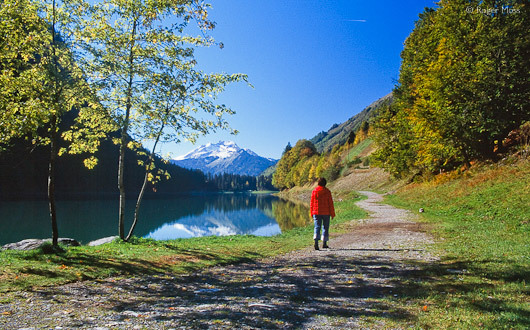 Nearby lies the tranquil Lac de Montriond, a convenient point of access for the local network of mountain footpaths (which in winter serve as cross-country or ski-de-fond pistes). It’s also a perfect setting for the excellent Hotel Restaurant le Bout du Lac. The Route, however, passes the ski station of Les Gets, before making the long, winding descent into Cluses. Following Scionzier (rather than Chamonix) signs will guide you safely through the town and onto the long, steady climb to the 1613m Col de la Colombière. Once safely over, the road falls through a series of hairpins towards the village of le Chinaillon. 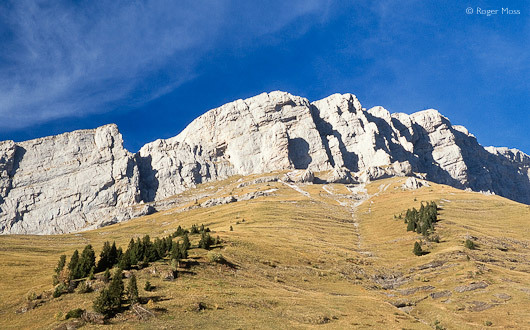 The panoramic views take in a picture-postcard landscape dotted with cheerful mountain chalets, dwarfed by the distinctive jagged spine of the Massif des Aravis. Further on, signs for local Reblochon cheese appear at le Grand Bornand, along with ski lifts. Skiing here has long been a way of life, and the Aravis lift-pass includes nearby St-Jean-de-Sixt and La Clusaz, one of the prettiest of all the medium-size ski villages. Beyond La Clusaz the road launches skywards once again, topping off at the 1486m Col des Aravis, whose roadside gift-shops offer passing visitors local crafts, sheepskin fleeces, etc. Beyond the Col we plunge headlong into the Val d’Arrondine via more hairpins and a short tunnel cut through solid rock. It’s a secret world, with tiny villages tucked into the steep valley sides. One of them, La Giettaz, (linked to Combloux) will soon be welcoming skiers and other winter visitors, but for now it’s a peaceful, pastoral idyll, with rich green pastures punctuated here and there by sun-bleached traditional chalets and autumnal stabs of fiery red and yellow foliage. Further down in the Val d’Arly villages like Crest-Voland, Flumet, Notre-Dame de Bellecombe and Praz-sur-Arly (not to mention Megêve) also offer winter sports close to the dramatic snow-capped peaks of Mont-Blanc. The villages’ respective terrains are now linked to form the impressive Espace Diamant ski area, and after cresting the Col des Saisies (1650m) we enter the village of Les Saisies, whose gentle terrain and dependable snow cover has made the area deservedly popular with family skiers. We’re now in the Beaufortain, entering the historic village of Hauteluce, clustered around the Italianate onion spire of its 16th Century Baroque church. 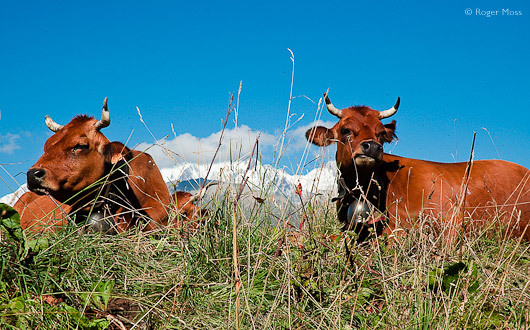 The wide views across the valley are accompanied by the sonorous tinkling of bells (‘clarines’) worn by the distinctive brown Tarine cattle whose milk goes into the illustrious AOC Beaufort cheese, much of which is still produced using time-honoured methods in the high Alpine pastures or Alpages. The remainder goes down to Beaufort-sur-Doron’s Cooperative Laitière, which offers visitors guided tours and also sells produce at wholesale prices. The historic town itself is also well worth spending some time getting to know. There’s little doubt that the Beaufortain is one of the undiscovered treasures of France, a point underlined as we leave on the invigorating ascent through forests to the shimmering Lac de Roselend and the craggy landscapes of the Cormet de Roselend (1967m). This section of road has only been surfaced since 1970, and all around lie simple gravel tracks leading to the remote summer pastures where dairy cattle graze contentedly. Their annual migration between the valley floor and the high alpages continues the age-old ritual of ‘transhumance’, and an AOC Beaufort Alpages chalet d’été cheese is incomparable. The Route was finally completed in July 1937, with the opening of the 2770m Col de l’Iséran, the highest pass in Europe. Despite the distinctive Route des Grandes Alpes signage, following the Route requires care. 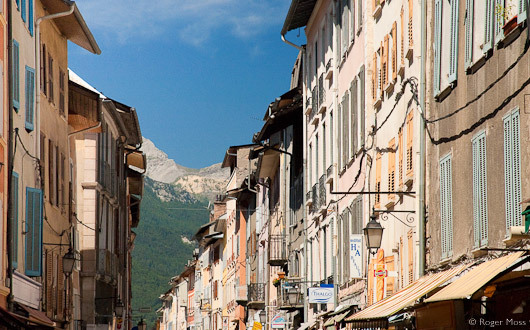 The dedicated IGN touring map will keep you on track, while the Route des Grandes Alpes (Ed. Gallimard) makes a highly informative travelling companion. The website Cols Cyclisme publishes live information indicating the state of the Cols. The Info Route 05 website gives up to the minute information on the state of cols in the Hautes-Alpes. 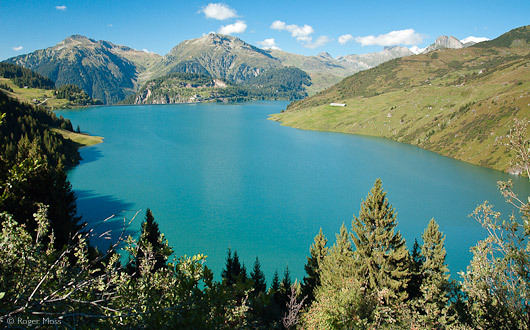 The Association Grande Traversée des Alpes was created in 1971 to promote sustainable tourism and activities between Lac Lèman and the Mediterranean. The Move Your Alps! 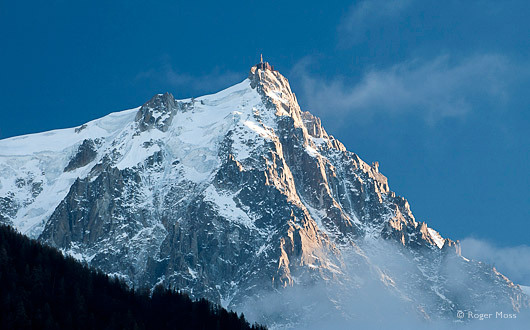 website (English version) details Alpine routes, trip ideas and accommodation. Very comfortable Auberge with excellent restaurant and situated in an authentic village near Thonon. The Chalet also has two restaurants overseen by chef Olivier Charlet. A wonderful authentic mountain chalet which has been in the Marin-Cudraz family for generations. Watch the sunset over Mont-Blanc from the front door. shoe discovery of the mountain landscapes. English spoken, vegetarians catered for. A friendly, welcoming hotel from which to enjoy the outdoor life of the mountains. Beautifully styled, welcoming and warm hotel restaurant with panoramic views and a short stroll into the charming village of Hauteluce. Doorstep skiing in the winter (conditions allowing). Basic but clean rooms with good views. Dine in the excellent restaurant, or on the large sun terrace.